BRUCE LEE ESTÁ DE VOLTA AO BLOG DO PEREIRA! THE BRUCE LEE SPECIAL IS BACK!! Como vocês bem sabem, muitas vezes por alguma razão de distância, falecimento, etc... Um Si Fu não pode estar responsável diretamente pelo Kung Fu de um praticante. E é nestas horas que entra a figura do Si Hing. 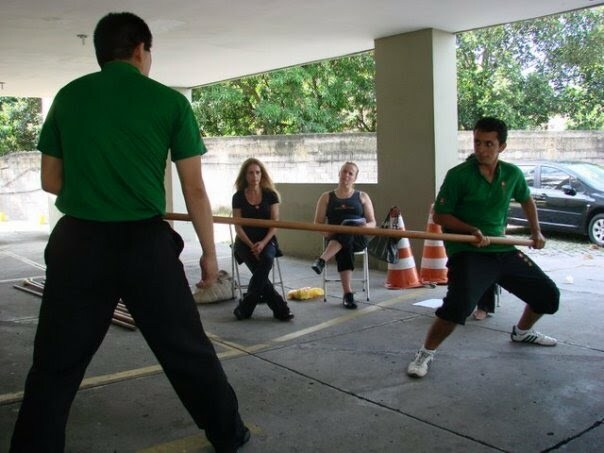 O irmão kung fu mais velho(Si Hing) vai fazer a ponte entre o kung fu do Mestre(Si Fu) e o desenvolvimento do praticante(To Dai). As you well know, often away for some reason, death, etc ... A Si Fu can not be directly responsible for a practitioner's Kung Fu . And is in these times that comes out the Si Hing. 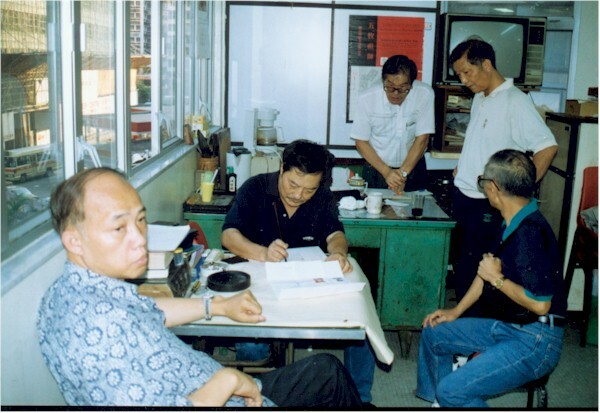 The older kung fu brother (Si Hing) will bridge the gap between the kung fu of the master (Si Fu) and the development of the practitioner (To Dai). 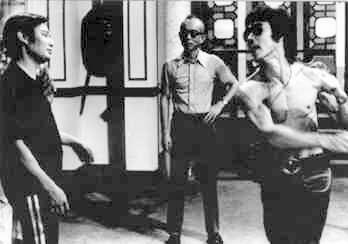 Para Bruce Lee, seu Si Hing mais próximo era Wong Shun Leung, um dos nomes mais respeitados dentro do Clã Ving Tsun até hoje. Tendo sido representado inclusive no filme "O GRANDE MESTRE 2" (Ip Man 2). MOY YAT & WONG SHUN LEUNG. Si Taai Gung entrou na Família KF, W. Shun Leung já era um Si Hing super respeitado. E todos o chamavam carinhosamente de Ah Leung. Moy Yat quando teve que dirigir-se a ele o chamou por esse mesmo apelido, mas ele não respondia. Apenas quando Moy Yat disse: "Si Hing!" , ele atendeu. Anos mais tarde, Wong Shun Leung afirmou que Moy Yat ainda era muito jovem na Familia Kung Fu para tratá-lo tão intimamente. Hoje, em nosso Clã, por mais intima que seja a relação entre dois praticantes, o termo Si Hing sempre é usado, a fim de lembrar o mais antigo, a responsabilidade dele com o Kung Fu do mais novo que o chama. In the photo above, we see Si Taai Gung Moy Yat, and among other big names of Ip Man Family is currently focusing on writing, Wong Shun Leung. On the relationship of the two, was once told that when Moy Yat entered the KF Family , W. Shun Leung was already a super respected Si Hing. And everyone called him affectionately as "Ah Leung" . Moy Yat when he had to call him, he called by that nickname, but Wong Shun Leung would not answer. Only when Moy Yat said, "Si Hing" He answered. Years later, Wong Shun Leung said to Moy Yat that he was still very young at the Kung Fu Family to treat him so closely. Today in our clan, however it is the intimate relationship between two practitioners, the term Si Hing is always used to remind the older, his responsibility with the Kung Fu of the younger . FILME EXATAMENTE COMO AH LEUNG. Wong Shun Leung is presented in the movie exactly as Ah Leung. Em 11 de Janeiro de 1970, Bruce Lee escreveu uma carta para Wong Shun Leung. 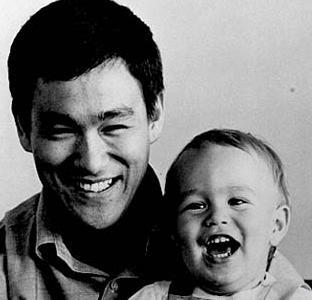 Bruce Lee e Brandon Lee ainda bebê. 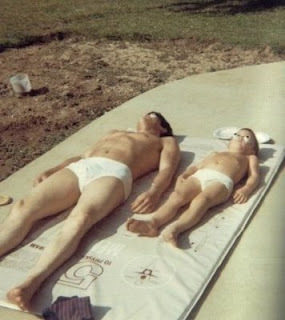 Bruce Lee e Brandon tomam sol na casa de Bel-Air. Bruce Lee and his son at Bel-Air´s house. casa de Bruce Lee vista de cima em Bel-Air. The house from a bird-view camera. 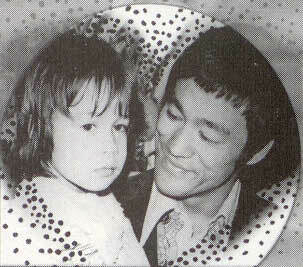 Bruce Lee e sua filha Shannon Lee. 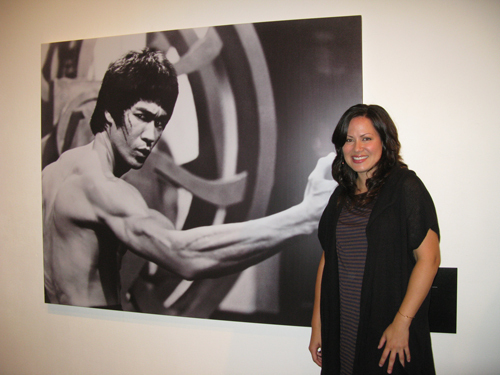 Shannon Lee continua viva até hoje. She´s still alive 'till today. ...Recentemente, eu ter organizado uma empresa. Escrevi uma história : "A Flauta Silenciosa". James Coburn e vamos atuar nesse filme. Stirling Silliphant é o roteirista. Ele é um famoso roteirista .Nós queremos fazer o primeiro filme de artes marciais em Hollywood. 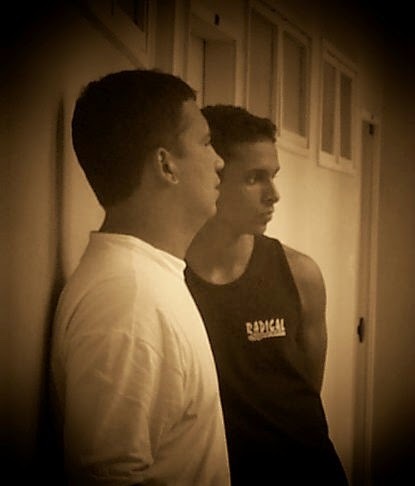 A perspectiva é boa.Daqui a seis meses a partir de agora, o trabalho de filmagem vai começar .Todos que vão participar neste filme são as meus alunos.No futuro, Steve Mcqueen também fará um filme comigo.Estou muito animado com este plano. 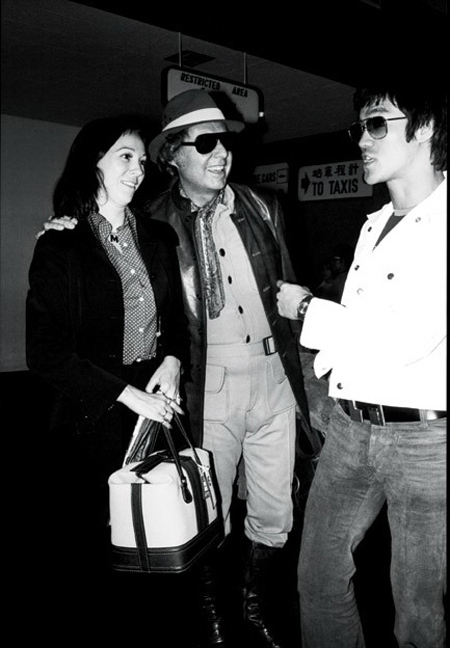 Bruce Lee e o roteirista e aluno Stirling Silliphant. Bruce Lee and his student Stirling Silliphant. Baseado na história de Bruce, o filme "Circulo de Ferro"
foi estrelado por David Carradine. Based in a story made by Bruce, the movie "Iron Circle" was starring by David Carradine. Quentin Tarantino put a easter-egg in this Kill Bill scene when Carradine playing flute talks about Pai Mei. In 1973, afther his death, Bruce did not seen "Enter the Dragon" becoming the greatest martial arts movie from all time. Also, the first one in Hollywood and the big hit of his career.With coreopraphies by him and his Si Hing Wong Shun Leung. Muito antes de Steven Seagal dar uma de coach do Anderson Silva, Bruce dava aulas privativas a Chuck Norris. Na foto, Bruce posa ao lado dele. 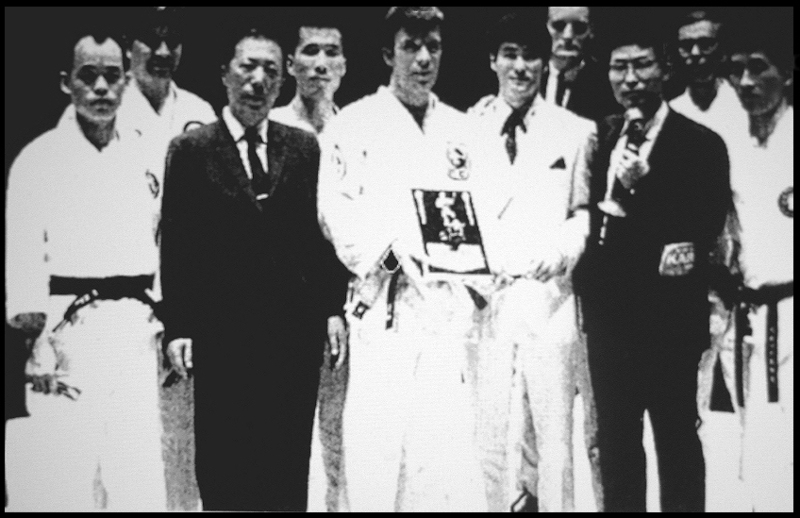 Very before Anderson Silva and Seagal (lol) , Bruce already supported Chuck Norris as we see in this photo. 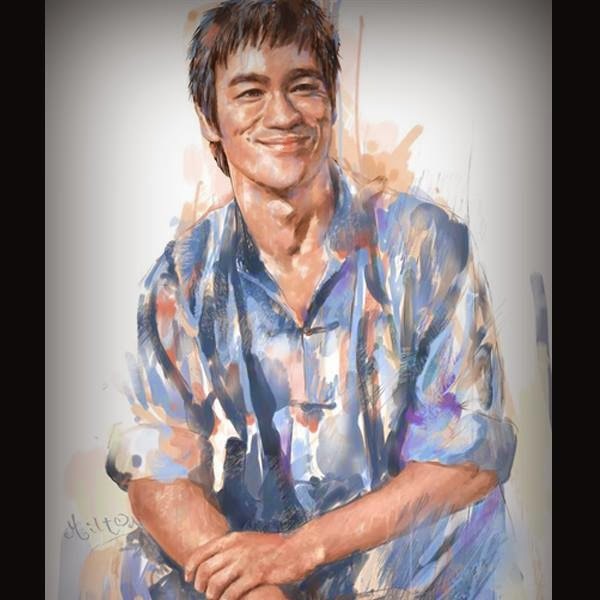 Stirling Silliphant, como roteirista, escreveum um episódio inteiro da série LONGSTREET, sobre a nova arte de Bruce, o Jeet Kune Do. Neste episódio, o próprio Bruce treina o personagem principal, e fala sua frase mais memorável: "Be water my friend..."
Stirling Silliphant written an entire episode of LONGSTREET to Bruce´s new art. In this episode we have Bruce Lee talking his most famous quote: "Be water my friend..."
...Agradeço-vos e a Si fu, por me ensinar os caminhos do Ving Tsun em Hong Kong. Na verdade, tenho de lhe agradecer por ter me levado a andar por um caminho prático .Especialmente nos Estados Unidos, existem pugilistas ocidentais, muitas vezes pratico com eles também. Há uma grande quantidade de auto-entitulados mestres em Ving Tsun aqui, eu realmente espero que eles não sejam tão cegos para lutar com esses caras. Eu viajarei para Hong Kong. Espero que você ainda esteja morando no mesmo lugar. Somos amigos íntimos, precisamos nos encontrar mais e conversar sobre o nosso passado .Isso será muito divertido, você não acha? 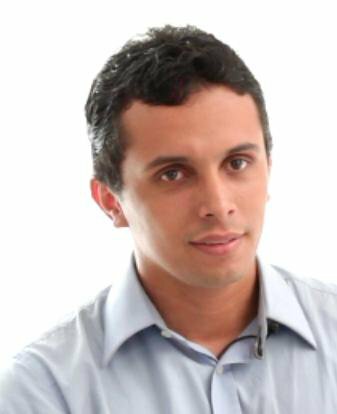 Quando você vir o Si Fu, por favor, envie meus cumprimentos a ele. Que a felicidade esteja com você! ...Now I have bought a house in Bel-Air.It is about half an acre. There are many trees. It has the taste of a range. It is located on a hill top near Beverly Hills.Moreover , besides my son Brandon, I have had a daughter,Shannon,who is seven months old. Have you re-married?Please,send my regards to your sisters. Recently, I have organized a film production company.I have also written a story "The Silent Flute". James Coburn and I will act in it.Stirling Silliphant is the screen play writer. 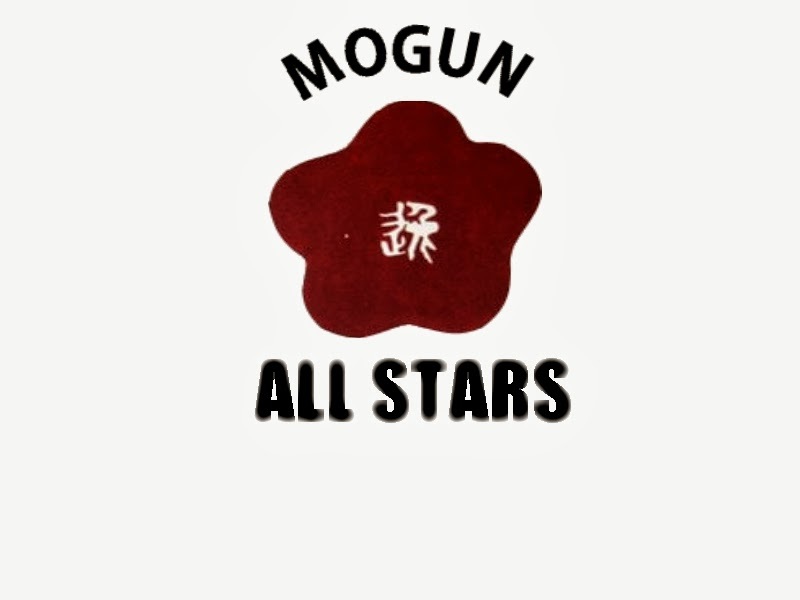 He is a famous screen play writer.We plan to make the first martial arts film in Hollywood. The prospect is good.About six months from now, the filming work will begin.Allwho participate in this film are my students.In the future, Steve Mcqueen may also work togheter with me.Im very excited about this plan. As to martial arts,I still practice daily. I teach my students and friends twice a week. It doesn´t matter if they are Western Boxers, Tae Kwon Do practitioners or wrestlers, I will teach them as long as they are friendly and will not get uptight. Since I started to practice realistic in 1966(protectors,gloves,etc) I feel that I had many prejudices before,and they are wrong. So I changed the name of the gist of my study to Jeet Kune Do. Jeet Kune Do is only a name. The most important thing is to avoid having bias in training. Of course, I run everyday, I practice my tools(punch,kick,trhow,etc) I have to raise , the basic conditions daily. Altough the principle of boxing is important,practicality is even more important. I thank you and Si fu, for teaching me the ways of Ving Tsun in Hong Kong. Actually, I have to thank you for leading me to walk on a practical road.Especially in the states,there are western boxers , I often practice with them too. There are a lot of so called masters in Ving Tsun here, I really hope that they will not be so blind to fight with those guys. I may trip to Hong Kong . I hope that you are still living is the same place. We are intimate friends, we need to meet more and chat about our past days.That will be a lot of fun, dont you think? When you see Si Fu ,please, send my regards to him.